It’s been a long time since the last newsletter, and for that I apologize. Sadly, things are not going well for Portable Scores, and dreading this newsletter has been the reason for its delay. I’m officially declaring Portable Scores to be in zombie state; I’m not working on it, not selling new products, and not doing any development, but I am keeping the web site up, the business registered, and the hope alive that someday the resources I need to make Portable Scores successful will become available. After our second Kickstarter failure, we opened a store to allow people to purchase hand made units. We had to build 16 for our biggest client and pre-order, so it made sense to open the batch up to allow people who really wanted to get a scoreboard to still have a chance. This resulted in another 10 orders fairly quickly, and we decided to stop taking orders after a few weeks so that we could be sure we could fulfill the orders and acquire enough parts. Manufacturing by hand is not sustainable. There are literally hundreds of components that need to be sourced/made/assembled. The peanut design is impractical using the methods I have available. Despite the many forms and frames I had to build, it still took a long time to build every unit, and everyone who saw me for the months it took to make those 26 units knew what an ordeal it was. Just about everything that could go wrong did, from bad 3D printer plastic to inconsistent wireless issues, and more. I found out that it cost more to use the laser cutter on the plastic than the plastic itself cost. The 3D printed remote controls. Each remote took 1 hour to print, and because we were having plastic issues with our printer, they had to be babysat, and frequently restarted. After printing, each one had to be sanded and cleaned. 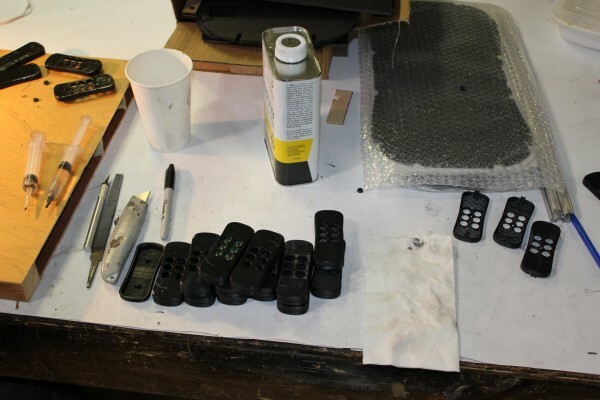 The rubber buttons for the remote and scoreboard were cast out of a rubbery material. To do that, I 3D printed a bunch of positives, created a mold out of them, then cast the parts in the mold. Very time consuming. The last of the orders was shipped out (that’s something to celebrate! ), and we are not taking any more orders for small runs. It just doesn’t make any sense. We also learned that international shipping is way too expensive, and we won’t be selling anything international anymore. This put us in a very challenging position. We can’t profitably manufacture in small quantities, and we haven’t been able to get the capital necessary to manufacture in larger quantities. We have all kinds of demand that we can’t meet, but all the investors think we don’t have enough traction and all the retailers and distributors want us to let them know when we are manufacturing and have stock to sell them. We learned that rentals are a win-win for us, and we have reserved 4 units for just that purpose. 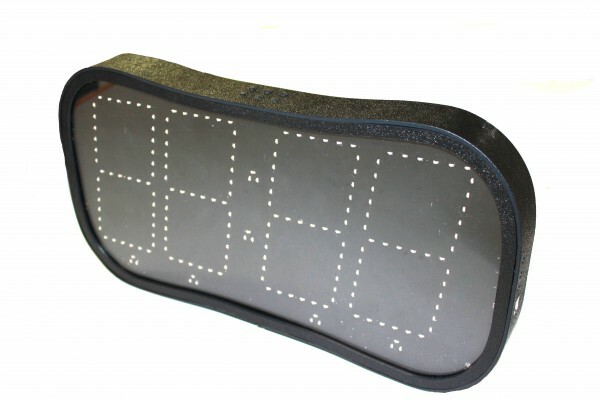 This allows us to get some traction, not part with our valuable scoreboards, bring in some income, and offer a product to customers who need a cheap solution for a single event. However, shipping the scoreboards out and back is expensive and stressful (we had a couple late returns), so we’re just renting locally. 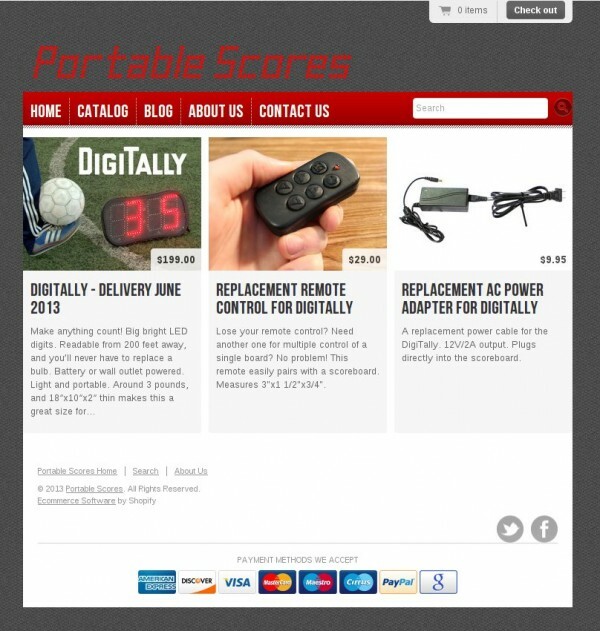 Because we have entered a period where success is looking less likely and more distant, I have bought out my business partner and am once again sole owner of Portable Scores. 1) Redesign the product and use different manufacturing methods so that I can produce them in small quantities. 2) Shelve Portable Scores for now and take on some of the other opportunities that have presented themselves recently until I can find a way to make it work. 3) Try to sell/license the design. This is indeed a dark time for Portable Scores, but personally and professionally I have gained a lot from the experience. I am now regularly consulted for my expertise, I am developing products that are much less complex and have a shorter path to profitability, and I have built a network of people I trust and like working with. I tell people Portable Scores has been my graduate school, and not only did it cost me less than real graduate school, but I got more out of it, too. Know that I am not giving up entirely. I love Portable Scores and the idea of making everyone’s games more professional and engaging. But where it is now I can’t justify continuing to throw everything I have at it. This probably won’t be the last newsletter. I would love to talk to you more about any part of this, ESPECIALLY if you know someone who is willing to invest or buy/license the design. I sold every unit that I made, and had requests from college football teams, game shows, high schools, churches, and lots of other people who were interested in DigiTally. The knowledge I gained from Portable Scores allowed me to develop and get to market in less than 6 months an ice fishing product called BlueTipz, which has sold over 3000 units and is in retail stores in most of the midwest, and has healthy online sales to over 20 states so far. In our last issue we were super excited about our Kickstarter launch. It didn’t go as well as we would have liked. That’s a bit of an understatement, but we’re moving on. The important part is that we learned a lot, we’ve made progress, and we have a backup plan we’ve been working on for a while that we’re executing now. Twitter is just about worthless. It’s an echo chamber. With all the @ and # and combined words and acronyms with no room for context, it is harder to read than code. Forums are harsh. We tried reaching out to people through Reddit and sport-specific forums, and we tried responding to questions and feedback, but there are a lot of trolls everywhere, and every negative comment hurt. Different markets have different price tolerances. For home consumers, the expectation for the DigiTally is much lower than we can produce right now in the low volumes we are (even 1000 is low. It takes a LOT of units to get production costs to a point where you can make a profit at Walmart). 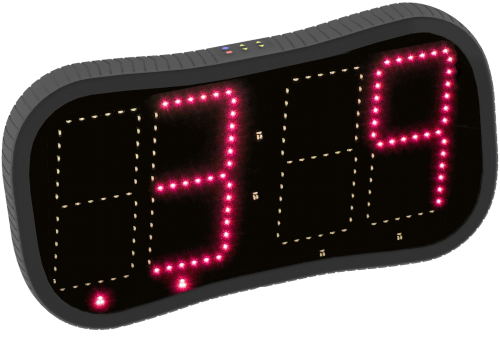 However, for tournaments, schools, and gyms, we’re less than half the price of our closest competitor, and easier to use and transport. In the end, we still didn’t find the answer to our biggest question; does the market want our product? If we can’t get our target market to even find out about our product, it might still be a false negative. We’re getting good at molding rubber parts now. We’ve been making molds for the buttons, and they look great. 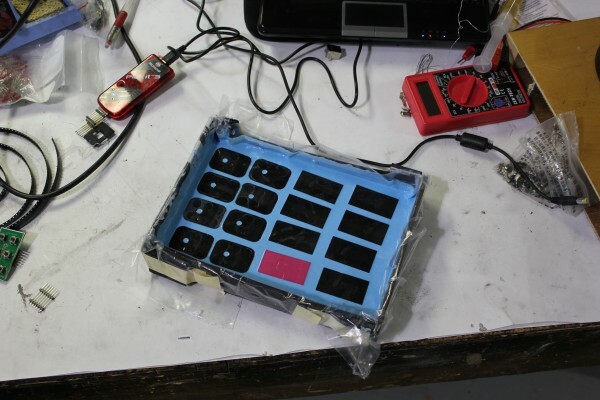 Here’s a 3D printed set of buttons that was turned into a silicon mold, which will be used to cast lots of little silicone buttons for the scoreboard and remote control. We’re getting amazing at designing laser-cut parts. We were already pretty good, but we’re doing some pretty complex stuff now. We are world class at Bluetooth Low Energy. BLE is so new there is only 1 book on it, and it was published in December. I’ve already read it twice. Building assembly rigs. We are making everything by hand, and that can get a little inconsistent and time consuming. 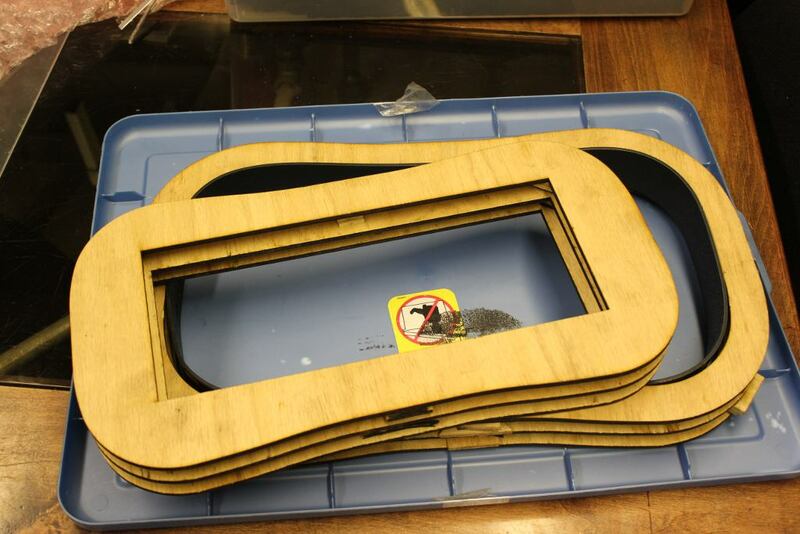 So we’re building parts that make it easy to consistently assemble and mold the various parts of the scoreboard. Here’s the form we use for the band. We laser cut the flat strip, heat it up, then quickly put it in the frame where it cools to the correct shape. We’re getting into the rental business. People have been wondering if they could use DigiTally just for a short period for an event, and since we have a hard time manufacturing large quantities, rentals seems like a win-win. We’ve already had our first rental customer through our new system. Slow and steady growth. We knew the Kickstarter crowd wasn’t our target market. We can’t get the price down enough for home consumers, and we won’t be able to until we’re producing in much larger quantities. So we’re going to go back to tap into our original target; the leagues, schools, and gyms, using the purchasing outlets they have access to. Sugar-daddy search. Meanwhile, we have this fantastic design for a gorgeous product, and we’re looking for someone who sees the vision and wants to help us grow a little faster. The next month will be busy. We’ll be the scoreboard at the Grilled Cheese Championships next weekend, and at the end of May we’ll have our scoreboards on every field for the Ultimate Frisbee College Nationals tournament, which will be televised on ESPN. We have a lot of soldering and laser cutting to do before then. We’re casting off the shackles of slowness, emerging early from our winter cocoon, and springing forward like our clocks did on Sunday. That’s not to say that we haven’t been working hard all along; we’ve had big things planned for a while. We’re just being more open about it now. So what’s new? We’re fundraising like mad! We’ve launched a Kickstarter project, and we need your support. Go check it out! Our beta testers list is getting longer and longer. We’ve been getting people requesting to be beta testers for a long time, and some of them have even paid for the privilege. We only have a few units, so we send them out for a while, get feedback, they get returned, and we send them out again. It’s worked out well so far. We have one unit that has been living at Sector67 for over a year now! Just like all things at the hackerspace, this one has been modified so that in addition to a buzzer at the end of the countdown timer, it also lights up some old police car lights. People do NOT talk over their time at our meetings. We’ve even been molding and casting our own parts, like the rubber band, which we were able to make ourselves for 1/10th the cost it would have been to 3D print it in rubber. See the mold process here. This gives us more insight into the manufacturing process and allows us to experiment with different materials and make subtle changes that will make the mass production easier on everybody. This is our production ready prototype, with 3D printed parts, a nice cast rubber seal, and the latest revision of the circuit board. With all these great things happening, you’d think we have everything covered. Well, we’re humans, and we’re not perfect. We need your help getting the word out to everyone. This Kickstarter campaign won’t succeed without hundreds of thousands of people looking at the site, and we need you to help with that. Many of you have already helped us out in some capacity, and I’m sure you’d love to see your help get recognized by the world. Those who wish they could do more, here’s your chance. If you know coaches, teachers, fitness instructors, sports buffs, or competitive soccer moms, please tell them about this project, and hurry! February 9, 2012, Incorporated. What started as a hobby project became an official business, and got serious. After a year of mixing contracting with development of the scoreboard, Bob decided to pursue it full time and made it official. February 29-June 1, China. Accepted into a hardware startup accelerator, Portable Scores traveled with 10 other companies to be in Shenzhen, China, for three months to develop their products and make manufacturing connections. See the blog Bob maintained for lots of stories about manufacturing in China. 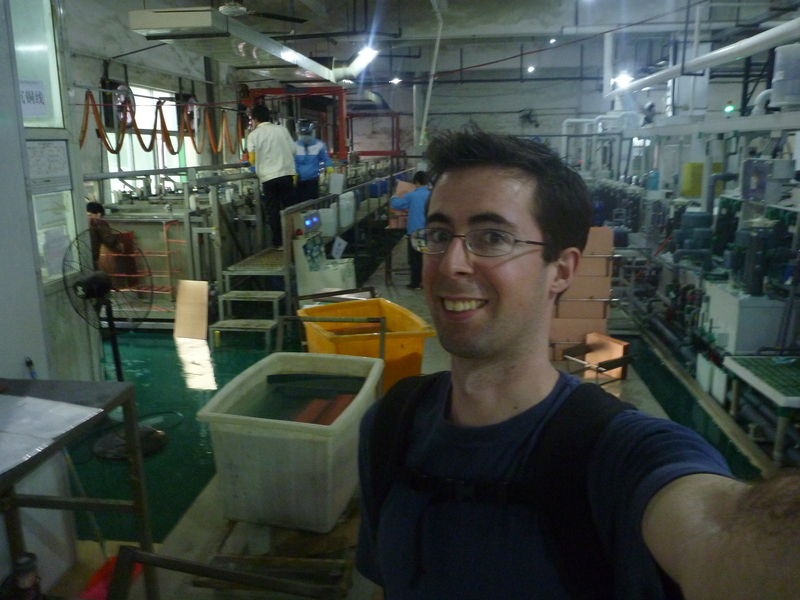 At a printed circuit board factory outside of Shenzhen. June 15-June 30, Depressing. After a failed launch on Kickstarter due to a lack of press, some regrouping was necessary. China took its toll, and the aftermath was both overwhelming and underwhelming. We learned how important it is to have a team, and that a single person can’t do everything in a company. July-August, Recovering. Perry Sieber joined the team as head of business development. We considered going back to Kickstarter and relaunching but decided not to rush things again. We got a pre-order, with a check, for more than a dozen units to support the Ultimate Frisbee College Nationals in 2013. August 10-11, VentureDraft. A conference for Venture Capitalists, startups, and athletes to get together and do cool things. We met Daymond John. During the pitch panel they asked us to leave the scoreboard on stage and time the other speakers. This did not please the other speakers. 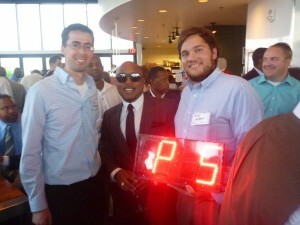 Bob with Daymond John of Shark Tank and FUBU fame. September, Mentors and Legal help. The University of Wisconsin pulled through and we got free legal help through the Law & Entrepreneurship Clinic to develop an operating agreement and do a patent search. Merlin Mentors accepted us and we got two awesome mentors to help us develop our product and business. September 22, BuildMadison. 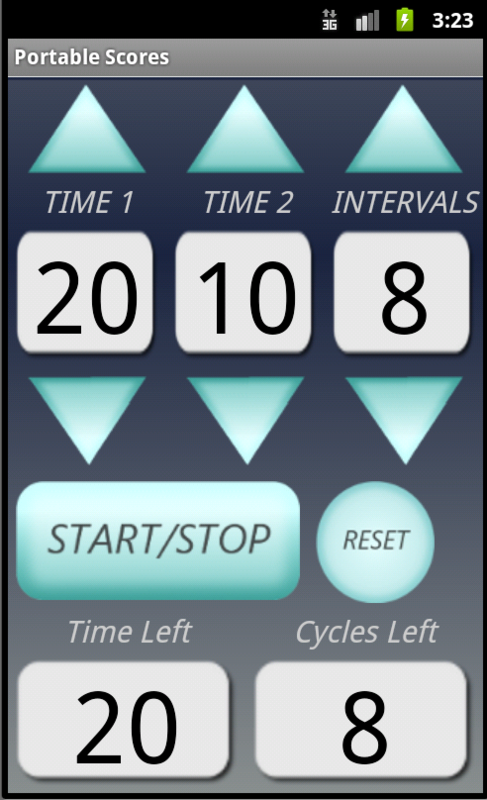 We spent 24 hours building an Android interval training app for a local fitness trainer that integrated with the scoreboard. October-December, refining and improving and learning. After several iterations of wireless technologies and FCC regulations issues, we’ve arrived at Bluetooth Low Energy and are happily moving forward with a pretty cool technology. The main scoreboard circuit board is on major revision 5. We started touring factories in Wisconsin. We talked with some professional engineering firms to validate the design. We spent a lot of time interviewing people and working on distribution channels, target markets, and funding options. We are regularly loaning out some of our units to people for feedback. January, plowing ahead. This is the year! We hired Katie, our branding genius and community builder to help us develop our brand and get publicity. We are actively pursuing funding sources (will you be one? ), and lining up all the components and factories and distribution channels. We are making final revisions of the design and ordering parts for verification that it all fits together and works right. We started designing and building the test rigs that will automatically test parts as they come off the assembly line to verify quality. The original scoreboard with a wood enclosure. 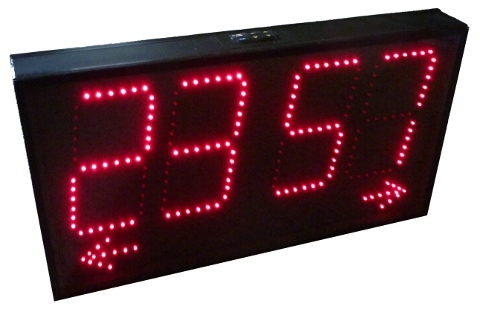 The new scoreboard, with a rugged enclosure, smaller form factor, and more features. Besides looking better, it’s more rugged, smaller (digits are the same size, though), more versatile, has better features, is brighter with longer battery life, and is easier to assemble.and test. So what’s happening in 2013? This year we take the product to market. We start by raising the funds for the first batch, then go to all our factories and tell them to do their thing, then we work on our distribution channels and get the product out there, and we market the heck out of it.Then we do a larger batch of units as the demand starts coming in. And we keep growing and developing the product and getting out there to see it in use. We have a lot going for us in the new year, and we’re excited to get past the development stage and get this product out there! Expect to see a lot more news and updates on our progress as we take this company big. We’ll be starting with a crowdfunding campaign within a few weeks, so be prepared to get the word out about Portable Scores. Many of the people who read this have been involved in the company in some way, helping make connections, offering advice, even telling their friends and the people they know about us. We’re extremely thankful to all of you and hope you feel that in some way, Portable Scores is partly due to you. Portable Scores is proud to sponsor TEDx Madison in 2013 by providing the timing systems for the event. Our scoreboard has been used by a lot of people to time speakers, and we’re proud to be showing off ours at this high profile event. We’ve been working on the design of the scoreboard a lot, and we’re finally happy with what we have. Here’s a video of the rendering we really like. There are a lot of features to point out. Clear polycarbonate face is the same material used in bulletproof glass. Kickstand for standing upright on the ground or table. Tripod mount for putting it up high. Holes for mounting on a wall. Convenient hand holds for carrying. Buttons on top for controlling it, with the buttons molded into the rubber grip for tight protection against water. A rubber grip around the edge to add water resistance, and protect it from drops and scrapes. Now we just need support to help us make it to production! Portable Scores is back in the United States for now. There were some things that needed to be done in the States that couldn’t be done easily in China. Ironically, this included producing a quantity of prototypes. The Sector67 hackerspace in Madison, WI has all of the tools and resources necessary for a small volume run, and I had access to these tools and the ability to experiment with them that I couldn’t find in China, where I was expected to provide a completed CAD model and a wad of cash and hope the product would come out OK. I will remain in the U.S. for a couple months to get the first batch of prototypes out to beta testers and do marketing and raise some funding and preorders for the first batch. Then I may be back in China to begin working with the factories to mass produce the scoreboard. Portable Scores had a booth at the Shenzhen Mini Maker Faire, where we showed off the scoreboard and got feedback from the makers at the event. The reaction was not what we expected. First, there was a problem with communication sometimes, but thankfully I had an amazing volunteer translator named Saidy to help me out. Second, people saw the scoreboard and didn’t understand what it was that was special. Perhaps it was because it looked like a product and not something ‘made.’ Perhaps it was because in Shenzhen there are LED displays EVERYWHERE, and this wasn’t particularly different from them. We performed an experiment and instead of showing people the thing working, we showed them the insides of the prototype, which is based on an Arduino and has colored wires running all over the place. That attracted people. Third, people walking by just saw a display counting time; they didn’t think it did more than that and just walked by. Only the people who stopped saw that it could be controlled from a variety of inputs and had a bunch of different modes for different sports. Despite the presentation issues, people who did talk to me liked the product and thought it could have lots of applications and saw the value. While I was there a few people interviewed me. Here’s one of the interviews, conducted by the awesome guys at Dangerous Prototypes. or see the video directly. I’m at 5:23. On TechCrunch recently was a series of articles on the gamification of life, and how sensors and metrics and analytics are becoming more important in our lives, and how tools are being developed that help people measure and qauntify everything, share it with their social networks, and improve their lives. Well, it struck a chord with us. That’s what we do! We’re all about helping you score your life better, and we’re making a tool, and even a platform, that can help you do that easily. We just wanted to share the articles as food for though on how you could apply this scoreboard to the gamification of YOUR life. 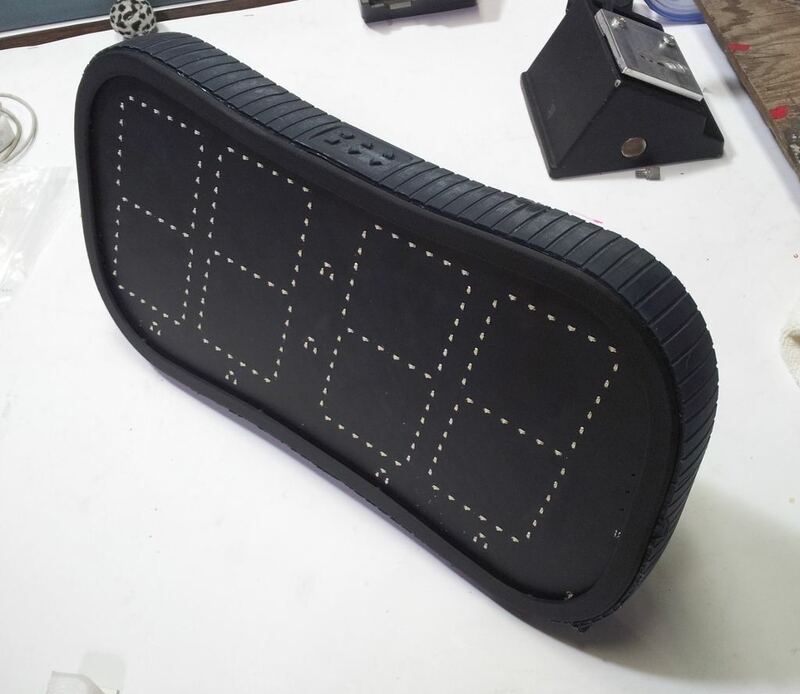 Portable Scores has moved its operations to China temporarily to work on manufacturing the scoreboard and making it even more awesome. There were some things slowing us down in the states, and here in China there are fewer distractions keeping us from building this. There has been a lot of debate lately about manufacturing in China and factory conditions and pollution, and the need for jobs in the U.S. and all kinds of ethics. We get it, and we’ve had to spend a lot of time reflecting on that as well. But there are a lot of factors that go into the decision, and ultimately manufacturing in China is what makes the most sense right now. Things are not nearly as bad as the media makes it out to be, and if it weren’t for the extremely hard beds, I would be sleeping at night, comfortable with the decision I made to be here. What does all this mean for you? Well, it means the scoreboard will probably be able to sell at the price point that we wanted (essentially what we would pay for something as awesome as this). 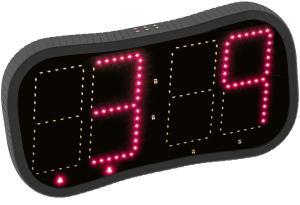 After getting quotes in the U.S. for various components, we would need to sell the scoreboard for double the price we wanted. In China, we are back on track. It also means the scoreboard production schedule is moving along, which means units shipped sooner. There were too many delays in the U.S. with tooling estimates alone pushing us back months. It also means a more advanced product. With access to quality designers and engineers willing to work with us to develop the product, we’re now able to make a product that will not only be in a condensed form factor (without compromising the size of the display), it will also be durable and stylish. You can learn more about the manufacturing process and experiences in China at our new blog Engineer In Shenzhen. This blog is for people who are interested in developing products in China and want to know what it’s like and what to expect. Stick around this blog for scoreboard related news, though.